One word sums up the QM 1000A flexi-system: flexibility. Mobile DJ, small band, bar installation, corporate theatre, audio visual multi media production, with the QM 1000A you can cover these compact production requirements all in the same week with just one system. The QM-1000 sub bass enclosure also contains 1 x 650 watt RMS mono bass amplifier, 2 x powerful 200 Watt RMS @ 8 ohms independently accessible satellite amplifiers, a system controller and a multiplicity of system configuration options. 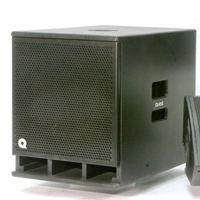 For instance, you can deploy the QM 1000A + 2 x QM-108 Mid/High units as a full-range cabinet to achieve professional results for full range high output in medium-sized venues and for band or DJ or add 2 powered satellite speakers to the system and use the Internal amplifiers to run two channels of independent fold-back. A 35 mm pole mount socket and two side handles completes the package.